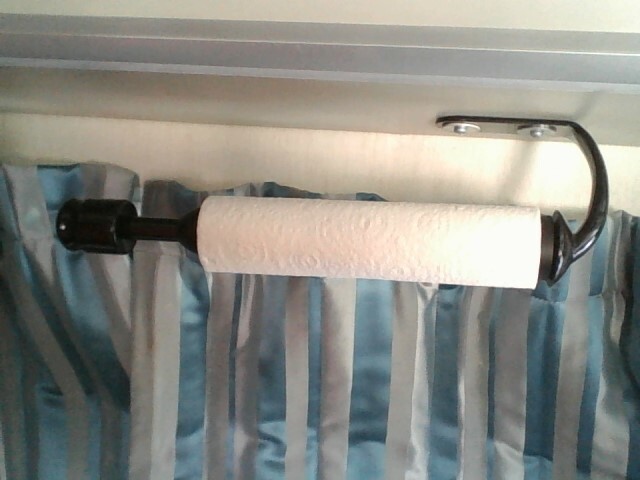 Fun Fact: The paper towels here have the same diameter paperboard roll on the inside, but the length of the rolls are are about 2.5 inches shorter than those in the US. Fortunately, this means my fancy paper towel dispenser still works, it just looks funky with a part that wouldn't normally show. The paper towels here also don't have the pick-a-size option. Only one size. However, that isn't as big a deal here, obviously, because the towels are smaller to begin with. As we drove along the Great Northern Highway, I knew we were getting close to the Northern Territory. This always breeds in me a sort of excitement, eager to cross the border. However, there was still plenty to enjoy in WA. Before we got to those exciting sites though, we managed to get 2 chips within a few hours of each other. When fixing the first chip, it cracked! Fortunately, it was on the passenger side, so not a big deal. Then, we didn’t find the 2nd chip, but we heard it. When I was later cleaning the windshield, I found it. This one had resulted in crack as well, but fortunately wasn’t heading to the driver’s region either. Fixing the first chip, resulting in a crack. The first good pic we have of a Wedge-tailed Eagle. They are always on the road eating roadkill. Turning off the highway, along the Tanami Road, there is a huge crater created by a meteorite. It is the 2nd largest to have been excavated (largest is in Arizona). So, I made Jonathan drive 3 hours along corrugated dirt roads to go see it. Because there is so little rain here, the crater hasn’t been filled with water and sediment. It is still very much defined. While driving along those roads, we discovered (when we were trying to get cows off the road) that our horn sounded more like a quietly whimpering puppy than its usual full-throated blast. Apparently the water from the creek crossings managed to get into the horn and make it gargle a bit. We had to unhook it, poke a hole in it, and let it dry for a while. From there, we returned to the highway for a few hundred kilometers before we turned off for another long corrugated road towards Purnulu (Bungle Bungle) National Park, at least this one had a lot more to do and look at. The park is designated as 4WD only, as you need high clearance and there are several creek crossings. From some pictures off a tourist website, we figured it would be about the same as the road from Tunnel Creek NP to the highway. However, the first creek crossing we came across was much wider than, and not as rocky as, we had expected. Fortunately it wasn’t very deep and fairly firm, and we made it across (horn removed until we were done with creek crossings). The actual creek crossing (first and worst one). Ominous foreboding from vehicles that had gone before us. You can see what is like from inside while going over that creek crossing. First off, we hit up Echidna Chasm, which is a really unique gorge that is particularly narrow. At some points, it is only 1m wide. What the van looks like after a multitude of creek crossings. The Bungle Bungle Range at sunset. Next day, we found the Bungle Bungles in the southern part of the park. These are the park’s main attractions. They are layered rock that has been worn away into the shape of beehives and domes, etc. Very photogenic and fun to walk through. One of the Bungles with a termite mound running up the side of it. They do this to avoid the floods in the wet season. A dry river bed made of solid rock. It had awesome lines through it made by debris scraping over it during the turbulent wet season. From there, we decided to head towards Wyndham, to pick up its touristy items: 5 Rivers Lookout, aboriginal rock paintings, and Parry Creek Lagoon. While here, we decided to pull out the A/C for an afternoon cool-off. Shortly after starting it, we got an error. Jonathan went to investigate and found that our cooling fans (located under the van) didn’t like getting submerged and debris stuck in them. After clearing them out, the A/C worked, but we found that one of the fans no longer starts on its own, sadly. So we have to go and manually spin it when we want A/C, which is a lot up north. Aboriginal rock art along a cliff face near Wyndham. Birds at Parry Creek Lagoon. From there, it was a stop in Kununurra for supplies and onto the NT border. We have finally left massive Western Australia. Here are some interesting statistics from our journey in Australia’s largest state. For a full day, we were super confused as all our clocks told us a different time. Our phones were set to WA time already, the computers were still on SA time, and our GPS was 45 min off from both! WA has 96 national parks! Its capital, Perth, is considered one of the most isolated capitals in the world, being nearly as close to Southeast Asia as to other Australian capitals. WA consists of 2.646 million sq km (1.021 million sq mi), which makes it whopping 34% of Australia’s entire area with only 11% of the national population. Its counties, also known as shires, are proportionally large, many of them still larger than 75% of the world’s countries! WA is currently free of the common fruit fly. However, it has plenty of other annoying flies to make up for it. After 5 months of being in Australia (Jan-16 to Jun-16) and nearly 2 months (minus 5 days) of being in WA, we crossed the border into the Northern Territory. If we thought that WA was sparsely populated and remote, Northern Territory is even more so. This large area isn’t even designated as a state and only has a territory-wide population of 200,000. We had no cell reception, except in the small towns that infrequently dotted the Victoria Highway. We were greeted with a 130 km/h speed (80+ mph) sign, a first for us since arriving in AUS. Jonathan commemorated the event by going the speed limit for a bit, which reminded us why don’t do so. The van takes a lot of energy to get to that speed. Our first night in NT was not enjoyable as some residents of Kununurra decided to stay at the same roadside stop as us and drink and talk all night long, leaving at daybreak. 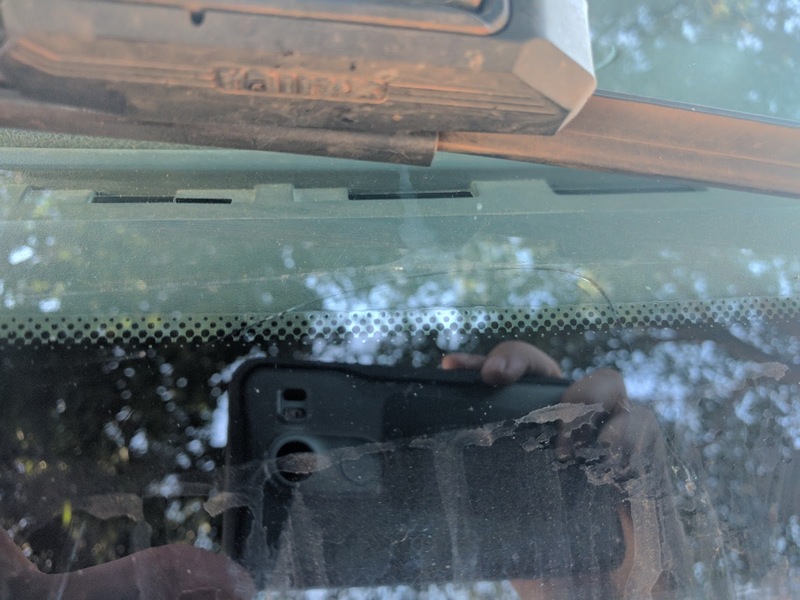 I guess this is a common thing to do around here, as this is the second time this has happened to us when parked at the nearest roadside stop to a town in WA on a Friday night. I guess this makes sense as the with the strict drinking policies most places in Australia have, and with the small populations, there are no late-night bars, clubs, or pubs to hang out in, so they go down the road and do it there, where no one (except the cheapo tourists like us) will complain. To break up the ride the following day, we made a few stops, including going on a hike in a massive national park through which the highway goes. The next day, we arrived in Katherine, a fairly large town by NT standards, and got caught up with the rest of the world’s news. Katherine is popular for its gorge and national park, so we decided to hit that up the next day. We had been planning on canoeing or kayaking down the gorge (apparently that is the thing to do), but they hadn’t finished their crocodile survey yet (conducted every year after the wet season), and therefore, weren’t letting anyone in the water. Instead, we chose to hike up to a few lookouts over the gorges. When we went to the visitor centre, it was apparent that there were small fruit bats all along the trees by the river. There were thousands of them. All along the banks as far as you could see! These Little Red Flying Foxes were smaller than the ones we saw in Karijini. The rocks along the gorge were really precariously perched. Jonathan managed to send several cascading down the cliffs. Not much holding them on. This wallaby was snacking in front of the van when we got back. Judging by the bulge on its belly, it could have a joey in its pouch. 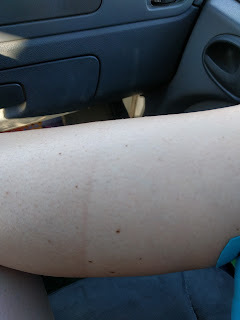 Despite doing close to 10 km that day, my knee was doing pretty well. It was a bit stiff the next day, but not too bad. So, it is healing. Thanks for your prayers. Hopefully, soon, it will be back to 100%. I was wearing a compression brace that day and apparently didn’t apply sunscreen well enough around it, so now I have a bit of a burned impression of it. This was taken a few days after the walk, so the redness had calmed down a bit. After Katherine Gorge, we decided to heard north to Litchfield National Park. On the way, though, we made a couple of stops. Also part of Nitmulik NP is Edith Falls. This was a pleasant stop. It would make a great vacation spot, with a restful and relaxing oasis atmosphere, plenty of walks and swimming, plus a cafe, cell reception and wifi nearby. In this region, spear grass is very common and grows very quickly. The stuff in the background is 4 months’ growth, while the stuff next to Jonathan is probably 6 months’ growth. Next on the list was Butterfly Gorge. This was a terrific stop! A short walk takes you to a small gorge where there are thousands of butterflies. Walking along will cause many of them to start fluttering around you, giving the place a magical feel. Then, we arrived at Litchfield. For many locals, this is a favorite park. I can see why. It is basically a free water resort. Surprisingly croc-free and with no entrance fee to the park, it is fairly irresistible. Our first stop was the termite mounds. They called them “magnetic”, but this is misleading. I was expecting to be able to stick a magnet on the mounds. But they actually meant that it lays its mound in a north-south direction to optimize temperatures. This is cool, but not as cool as magnets. They should call them compass instead of magnetic. This is a cathedral termite’s mound. From there, we managed to get a rock pool all to ourselves for about 10 min before others joined us at Buley Rockhole. The next day, we got an early start and managed to hit all the other spots. We don’t really like to sit and play in water all day, so what normally takes people several days, we finished in 1 day. Check out these green tree ants! They have reddish brown bodies with a green thorax! They make this nest by folding living leaves over and glue them together using their larva’s silk. Bamboo Creek Tin Mine ruins. Then, we were heading north along the back route to Darwin, Australia’s only tropical capital city. Thanks! I still have quite a few posts left. At some point I will try to post up a thread on our New Zealand leg (in progress). Following our visit to Litchfield, we continued north to Darwin, taking the northern exit from the park. Darwin is a strange confluence of various influences. The English settlers, Southeast Asian Islanders, and Aboriginal cultures all come together in tropical city with a monsoon climate. The city has some interesting history, and saw plenty of action during WWII. Like most Australian cities, Darwin has well-funded public spaces, and interesting places to visit. Given the cost of accommodation in any major Australian city and the warm/humid weather, we opted to keep our visit to Darwin on the short side. Our first point of interest in the city (after parking near the waterfront) was the WWII fuel storage tunnels. Built under a short distance from the port, these tunnels were actually enormous underground tanks for storing fuel for military purposes. Originally built to replace above ground tanks (which were bombed by the Japanese) only a few saw service due to their poor design. At over 200ft long, and 12ft high, they stored huge amounts of fuel. However, the regular rains saturated the rock above leading to corrosion and leaks, eventually causing a blowout in the 60s in the tank remaining in service. One tank has been opened for visitors. You can see the water constantly pouring from holes in the steel (even during the dry season!). Here is one of the closed tanks, Even with the drains open, there is still several inches of water. After enjoying some time near the waterfront we did a bit of a tour through the downtown area, and around the NT parliament building. After which we visited the old QANTAS hangar. Qantas is now a major international airline, but it started out servicing Queensland and NT. Now belonging to a local machine and car club, the hangar is filled with all manner of classic cars, industrial antiques, and steam powered equipment. Bombed during a Japanese raid, the superstructure still has shrapnel holes See the orange spots below. There are several very good museums (art etc) as well as plenty of great Asian food available. After finishing up in the city, we headed south to the Territory Wildlife park. Basically more of an “open range”-feeling zoo, it has an impressive array of NT animals, including a fairly large saltwater aquarium. We arrived late in the day, and not wanting to make the trip again (or pay the local rates for accommodation) we opted to take the 2 hours before closing. There were only 5 people in the park, and we basically had it to ourselves. This water monitor (about 3 feet long) was hiding in the water looking for some dinner. We spotted this mid-sized freshwater crocodile as well (about 4 feet long). A 4 meter saltwater crocodile. Fun Fact (by Jen): Since about Port Hedland in Western Australia, we have had trouble with our bread molding within days of use and even before the expiration. Perhaps it has something to do with the weather in the northern part of the country or perhaps the time it takes to get to these remote locations. We have had to make room in the fridge for the bread full time. Apparently the stores have this issue as well. 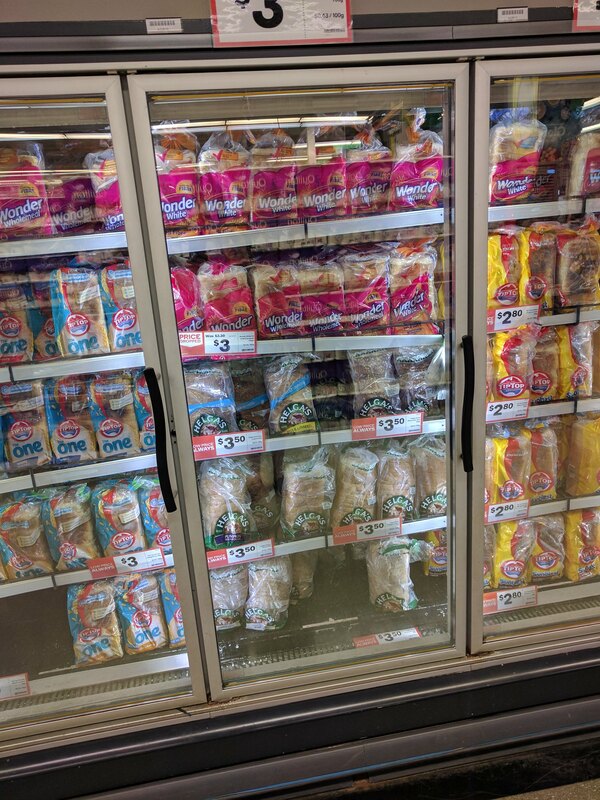 All bread in stores since Port Hedland has been in its own freezer section. One of the major national parks in NT, Kakadu is one of the largest in the territory. Known for its rock art, and intact unique biosphere, it is also one of the only two parks in NT which charges an entry fee (exorbitant in my opinion). Here is a sampling of the rock art that can be seen in numerous areas throughout the park. Indigenous peoples have been using these areas for thousands of years. In many, there are successive layers of rock paintings overlapping each other going back as far as 15,000 years. The views are pretty good too. Darwin and Ubirr are as far north as we will be in Australia (approx. 12.4° S) unless we decide to go up to the Tip (approx 10.7° S) of Cape York (still in debate currently as it is a long 4WD road). The road leading up to Darwin also connects (via pavement, which is really important) to Alice Springs in the iconic red center of Australia. That combined with the fact that it was the right time (the dry, cool season) of year to visit the center made us decide to head south again to mark that section off our list before resuming our journey across the north of the country. However, to get to the red center requires driving around 1400km south from Darwin. It is in the middle of the Northern Territory, whose population is miniscule, which means cell reception and POIs are few and far between. We made the trip in a few days, with a few stops to break up the monotony. First stop was Mataranka, where a set of “thermal springs” are the attraction. These actually aren’t springs that are heated by magma (etc). They are simply heated by the surface temperature of the earth’s crust as it is warmed by the sun. The result is a lukewarm water that isn’t too cold to swim in, even in the “winter.” Of course, since it is still in the tropics, the weather was still pretty warm during the day and night. The spring known as Bitter Springs has this beautiful blue-green water because of the calcium and algae growing in it. Elsey National Park had it set up so that you could enter into the stream at one point, then float downstream to another point then walk back to your stuff. We decided to give it a try. After visiting a few springs and doing a botanical walk in the small national park, we decided to go find a camp spot and call it day. The next day held much less of interest. One of the roadhouses on the way had a small aircraft which had crash landed at some point. We assume it was hauled and deposited there (no sign of wreckage in the area). I found the terrain interesting as we drove along. It was mostly flat, but there were a lot more trees than I was expecting in the “arid desert” center. We had forests and tall trees for about half of the distance to Alice Springs. Then they slowly got shorter and sparser. But even around Alice and such, there were still plenty of trees, tall brush, and grass. A far cry from the sandy desert-like center I had always imagined. Most notable along this route are the Devil’s Marbles, which are large rounded boulders all in a small area along the highway. One of the roadhouses along the road was known for its eclectic collection of banknotes, postcards, and memorabilia on the walls. This tradition began as a way to guarantee that you would be able to have a beer when you next come through. A person would right his name on a bank note and pin it to the wall. You can see how it has evolved. We added our own card to the wall.